If your children ask to wear a peg leg and carry a bottle of rum to school, don't be alarmed. 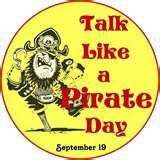 It's just International Talk Like a Pirate Day. But wait that's not till September 19! Why would kids be celebrating now? Well, it could be they're getting ready for the Michigan Pirate Festival in August. Or it could just be that with school ending, they're looking for fun, pirate style. So why wait till August or September for some pirate fun? Here are free printable pirate crafts, pirate ship models, paper boats and pirate activities to kick off summer. So if you were wondering there really is a Talk Like a Pirate Day. It was started in 1995 by Mark "Cap'n Slappy" Summers and John "Ol' Chumbucket" Baur. Personally, this author thinks it was just an excuse for two grown men to play dress up and entice women to sport corsets. At any rate, schools and many businesses get in on the fun. You can, too with free printable pirate crafts, games and toys. And side-stepping the less savory aspects of pirate lore, this article includes lesson plans on navigation, maritime and marine and nautical lesson plans, too. That way teachers and home-school parents can indulge their inner pirate and call it educational. * Start with free printable Disney "Pirates of the Caribbean" coloring pages from Coloring Book Info. No Talk Like a Pirate Day is complete without a nod to POTC pirate crafts Not since "Treasure Island" have pirates been so in vogue. Johnny Depp gave a memorable and oft-imitated Capt. Jack Sparrow, but the best of all pirates is Geoff Rush as Barbossa. Check out these free printable Jake and the Never Land Pirates coloring pages too. And hey, girls can be pirates too. Here are free printable Pirate Fairy coloring pages. * Boat-Links is subtitled "The Mother of All Maritime Links," and it's rightly named. The site is a comprehensive collection of hundreds of free printable nautical resources about nautical science, navigation, sailing, maritime history, merchant marine, the U.S. Navy, naval history in other countries, naval warfare, maritime museums around the world, nautical music and paper boats. * Celestial Navigation. Before modern navigation, pirates and sailors relied on the sky to guide voyages. Ancient instruments such as the sextant, astrolabe, cross-staff, quadrant, kamal (latitude hook) and nocturnal were indispensable. This site shows how to make ancient and medieval navigational tools. * Boats, Ships and Subs has dozens of links for free printable paper boats and ship models. There are sailing vessels from all periods in history, including clipper ships, Chinese junks, Roman warships, Coast Guard boats, viking long boats, pirate ship models and models of the Titanic and Thor Heyerdahl's Kon-Tiki. * Disney Experience has free printable nautical toys and pirate crafts from maritime-themed movies. There's a Spanish galleon, Capt. Nemo's Nautilus, Jack Sparrow's compass, dead man's chest, Cortez's treasure chest, a Mark Twain riverboat and several other models. Raven's Blight has an awesome array of creepy free printable pirate ship models, ghost pirate ship models, paper boats and more. Perfect for Talk Like a Pirate Day. * The Toymaker has a free printable puppet theater in which children can act out the adventures of Florimel the Magnificent. Florimel is a rabbit sailor who has adventures on the high seas in his "Golden Hind" inspired sailing ship. The youngest children can enjoy this for Talk Like a Pirate Day. * Lee Hansen has free printable pirate crafts, party activities and pirate crafts. DL-TK has free printable pirate crafts and party activities too. Coloring Pages for Boys has dozens of realistic free printable coloring pages of paper boats, ships and submarines for many periods in history. There are also coloring pages of pirate ship models and dreadnought class paper boats.